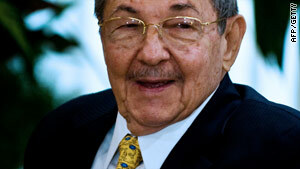 Cuban President Raul Castro has replaced high-level ministers. Transportation Minister fired for "errors in the performance of duties"
Havana, Cuba (CNN) -- Cuban President Raul Castro replaced two high-level government ministers Monday -- citing errors and incompetence -- in the latest round of replacements at top-level government posts. Sugar Minister Luis Manuel Avila Gonzalez was fired after requesting his release because of admitted shortcomings in his own performance, according to an official statement published Tuesday in the country's state-run newspaper. Orlando Celso Garcia Ramirez will replace him, it said. Transportation Minister Jorge Luis Sierra Cruz was fired due to "errors in the performance of duties," state media reported. He also lost his post as a vice president on a top governing body called the Council of Ministers, it said. Transport Director Maside Cesar Ignacio Arocha replaced Sierra at the Transport Ministry, while Gen. Antonio Enrique Lusson Batlle -- a long-time commander in the Cuban army -- assumed Sierra's post on the Council of Ministers. President Raul Castro, once the world's longest serving defense minister, assumed the presidency in 2006 when his older brother, Fidel Castro, stepped down because of illness -- at first temporarily, and then permanently in 2008. Since then, many analysts have speculated that the younger Castro has worked to consolidate power, replacing top government posts with army brass. "The Cabinet is now substantially different to what it was in 2006, and substantially different to what it was in 2008," when Fidel Castro officially ceded power, said Julia Sweig, senior fellow at Council on Foreign Relations and recent author of "Cuba: What Everyone Needs to Know." "Of course this is Castro solidifying control," she said, "but it's also an attempt to impose a culture of governance and efficiency" in leadership positions that "under Fidel were very uneven." Sweig and others contend that recent changes in leadership may be part of broader economic measures intended to streamline Cuba's bloated state sector, which Raul Castro recently said has supported an excess of up to a million workers. Avila's release from Cuba's Sugar Ministry also has raised questions about its broader future. Once a world leader in sugar exportation, Cuba has faced a steady decline since the collapse of the Soviet Union and the accompanying subsidies that once boosted sugar production on the island nation. Widespread speculation suggests the country may eventually close its Sugar Ministry or even open it up to foreign investment in an effort to boost Cuba's cash-strapped economy. "If that pans out, they may be bringing in someone [at the Sugar Ministry] who is more suited to that task," said Cuba analyst Phil Peters from the Lexington Institute in Washington. "It may be aimed at foreign investment," he said, adding that "Brazil and others could really help turn that sector into an energy producer." Later Tuesday morning, Tourism Minister Manuel Marrero announced plans to open up real estate to foreign investment on tourism-related projects, laying out plans for new hotels across the country. The move comes only weeks after Cuba instituted a pilot program of turning over hundreds of state-run barber shops and beauty salons to employees. Since taking office, Castro has allowed such small liberalization measures and tackled corruption, fostering the creation of a comptroller general's office intended to better manage state revenues. Monday's replacements come on the heels of the removal of Rogelio Acevedo, long-time head of the country's airlines and airport. While no official explanation was given for Acevedo's release, it prompted widespread speculation of corruption. In an uncharacteristically critical article published on a state-sanctioned website last month, Cuban columnist Esteban Morales called corruption a greater threat to the island nation than internal dissent, specifically noting Acevedo's dismissal. "Corruption is the real counterrevolution," Morales wrote, cautioning against groups entrenched in the country's Communist system.